The World’s Most Sustainable Country: What? Cuba? After 50 years of pretending that Cuba is not there, the United States government this year admitted that, well, it is still there (even Fidel Castro is still there) and we may as well deal with it. This is seen in some quarters as progress. But it is widely assumed that American business will swoop in there and upgrade them from their 1967 DeSoto cars, re-mechanize their agriculture, build fast-food restaurants, and stamp out Communism. It’s what we do. What we should do is recognize that Cuba confronted in 1991 precisely the kind of Apocalypse that looms before us today — the sudden loss of external inputs to the economy — things such as oil, heavy equipment, cars, and did we mention oil? — and handled it. We have more to learn from them than there is likely time to learn before we are in the soup, but we should do the best we can, because there is no better example in the world for meeting and besting such a crisis. The World Wildlife Fund in its 2006 Sustainability Index Report cited Cuba as the only sustainable country in the world. To comprehend the magnitude of that achievement, and its significance for our world today, we need to go back to 1990. Cuba then was the very model of industrial agriculture, turning most of its land over to vast monocultures of sugar cane, applying oceans of imported oil to till it, spray it (Cuba at the time used more pesticides than the United States), harvest it and ship it to the Soviet Union in return for oil and food. Most of what was grown in Cuba was exported; most of what was eaten in Cuba was imported. When the Soviet Union collapsed in 1991, Cuba, under embargo by the United States, had no market for its agricultural products and no way to pay for imported oil or food. An industrial country wakes up one morning to no more oil. Just like that. Motivated now by survival, not by profit, Cubans did what smart people have been telling us all to do for decades now. They stopped wresting cash from their punished land and started to heal it in order to have enough food to live. It was tough, starting from scratch, with the crisis already upon them. In the decade that followed the average Cuban adult lost 20 pounds. They brought in experts in Permaculture from Australia and launched a national drive toward diversified, organic, polycultural, restorative agriculture. They did not do this because they wanted to save “the environment,” they did it because they wanted to save themselves. And that is why they succeeded. By the end of that first decade the average Cuban was getting 2600 calories and more than 68 grams of protein, an amount considered “sufficient” by the United Nations Food and Agriculture Organization. By 2006 average caloric intake was up to 3356 calories. A lot of this food was produced not in the countryside (requiring transport to the cities) but in urban gardens, where food was grown and consumed in the same neighborhood. By 2002, 35,000 acres of urban gardens produced 3.4 million tons of food. In Havana, 90% of the city’s fresh produce came from local urban farms and gardens, all organic. 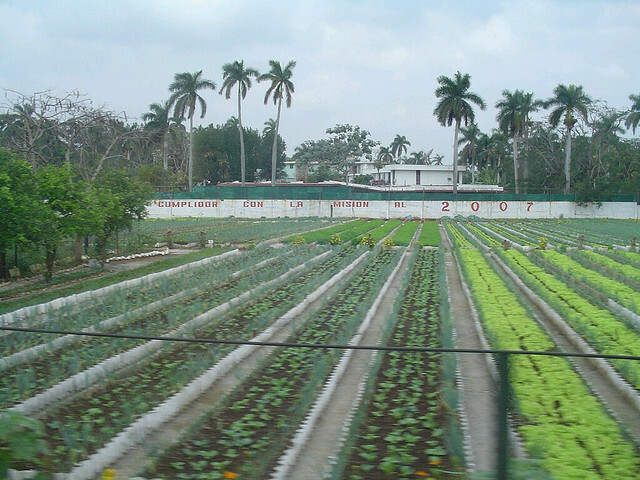 In 2003, more than 200,000 Cubans were employed in urban agriculture. In 2003, Cuba had reduced its use of Diesel fuel by more than 50%, synthetic fertilizers by 90%, and chemical insecticides by 83%. Cuba’s achievements, in the face of exactly the kind of test we will soon face, are nothing short of awe-inspiring. Our obvious course, now that we are resuming a normal relationship, would be to commend them on what they have done and to invite teachers and consultants to come here to America and show our farmers how to stop destroying the earth and start feeding our people sustainably. So that’s what we’re going to do, right?